Swedbank’s chief economist, Harald Andreassen, isn’t “too hopeful” about the long-term prospects for the oil price, but then again, “I’m less certain of this than I’ve ever been as an economist,” he told a floating production conference in Oslo. After two-and-half years of oil-price collapse followed by layoffs in the thousands; stacked oil rigs and order freezes for offshore shipping, price insecurity itself is a partial expression of confidence. “If you’ve survived this far, then you’ll come back next year.” He then offered a long-term, ballpark “balance price” for oil at about $60. Near Oslo, a handful of offshore start-ups entered the fray just as the still-painful downturn was at its gloomiest. Part of an incubating program called Techmakers, these start-ups are being carefully watched by operators Statoil and Lundin as well as supplier-contractors Aker, Kongsberg, TechnipFMC and Aramco Energy Ventures. 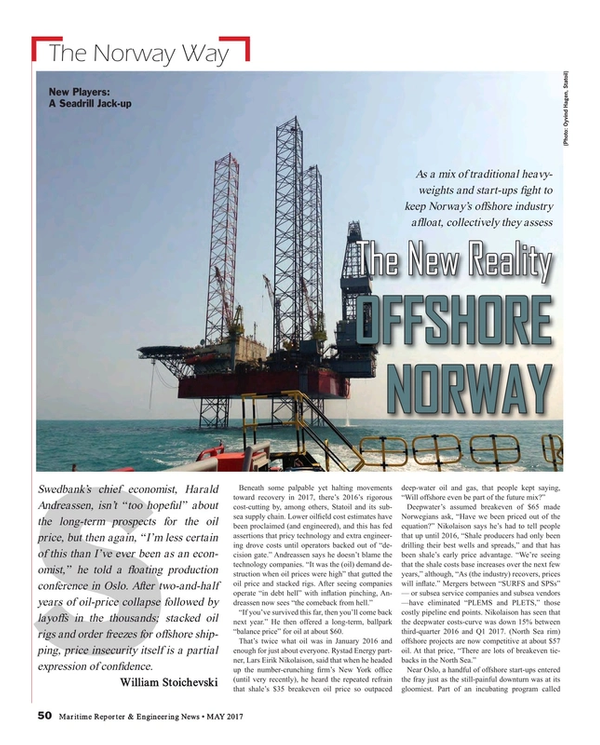 Riser installations and maintenance are set to continue apace in Norway, with pipelines — what risers connect to — the only type of investment that did not dip in 2017 over the previous year. Overall, the industry surveys of Statistics Norway put oilfield investments for 2017 at $21.8 billion, 13 percent less than in 2016 on cancelled exploration wells but less a dip than expected. The numbers are seldom weighted against the boomtime 70 percent hike in investments off Norway between 2010 to 2014. Still, spending fell off 27 percent between 2014 and 2016 and we’re on course for 13 percent less in 2017. The big dip between 2015 and now was mostly operator cost-cutting. Today, Statoil’s travelling presenters report the average breakeven oil price for its projects has dropped from $70 to below $30, helped by the roughly $20 oil-price breakeven made possible by economies of scale at the giant Johan Sverdrup field, where the first subsea infrastructure, a water-injection template, has just been installed, the first of many. Supplier fortunes are expected to rise in capital-intensive Norway on coming investments in the arctic floating producer, Johan Castberg; the heavily subsea Snorre Expansion project; another gas train at the arctic Snøhvit field and the Troll Phase 3, Part 1 of subsea frames and pipelines. To help an operator like Statoil gain full oversight of all those projects, new outfit Avito Loops has an integrated cloud solution that lays it all out in plain, detailed view: projects, portfolios, campaigns, business. Avito shows “your current state” and “your desired state” … A bit like Google Maps, it says, by showing where you are and where you need to go. For aging installations in mature areas, Western Norway newbie, Connector Subsea Solutions, has developed a technique to remotely do pipe repairs in deep water, and contracts with BP and Shell are already bringing in some earnings. While clamping a repair on a horizontal pipe is hard enough, Connector, or CSS, has managed to get its tool to remove the coatings of and then repair a vertical pipe, or riser. “We’re bullish on offshore,” affirms Rystad’s Nikolaison, emphasizing that, “That’s different than “Goldman. Deepwater, he notes, will see the benefits of the supply chain’s efficiency work to date. There’ll be a rising number of investment decisions by year-end 2017 and rig rates will rise.